Seated tickets are purchased by online ballot only. The online ballot will close on 1st March 2019, with successful entries being selected and notified by 31st March 2019. Purchase wheelchair tickets (maximum of two). All wheelchair tickets are accompanied with a free companion ticket. Standing tickets will be available to purchase after ballot entries for seated tickets closes. 1st Battalion Grenadier Guards will Troop their Colour in the presence of Her Majesty The Queen on 8 June 2019. Taking part will be up to 1450 soldiers of the Household Division and The King’s Troop Royal Horse Artillery, along with up to 400 musicians from the Massed Bands. Over 240 soldiers from the 1st Battalion Welsh Guards will line The Mall. The ceremony of Trooping the Colour is believed to have been first performed during the reign of King Charles II (1660–1685). In 1748 it was decided that this parade would be used to mark the official birthday of The Sovereign. It became an annual event after George III became King in 1760. Guards taking part are drawn from the Regiments of The Sovereign’s Household Troops. It has become the practice for them to troop their Colours in turn. Her Majesty The Queen has taken the salute at every parade since her accession to the throne in 1952 other than in 1955 when there was a national rail strike. Her Majesty‘s actual birthday is 21st April. The Sovereign’s official birthday is marked by the ceremony of Trooping the Colour, which this year falls on the 8th June 2019. Members of the public can watch from the stands on Horse Guards Parade by applying for tickets through the ballot. The Parade begins at Horse Guards at 10.00am and will finish by 12.25pm. On the day of The Queen’s Birthday Parade only (8th June), the fly-past by the Royal Air Force takes place (only on QBP 8th June) at 1.00pm and can be watched from the Mall. The Queen’s Birthday Parade is also broadcast live on the BBC in the UK on 8th June 2019. Trooping the Colour reviewed by The Major General and Trooping the Colour reviewed by HRH The Duke of York have a restriction on the number of tickets purchased to no more than 100 per application; if a group requires more, please contact us. Wheelchair tickets are limited to a maximum of 2 per booking. Each wheelchair ticket includes a space for a wheelchair and a seat for one companion. 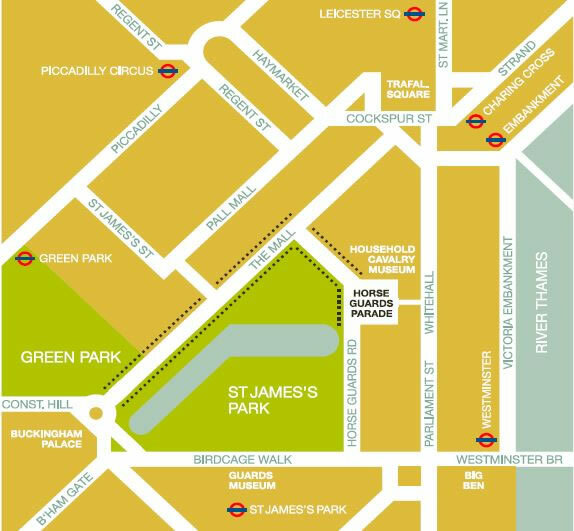 For Trooping the Colour reviewed by HM The Queen tickets for seated stands around Horse Guards Parade are allocated by ballot. Up to a maximum of 4 tickets can be applied for. Do not enter the ballot more than once. Successful ballots will be notified by 31st March 2019. Unfortunately, if you are not successful in the ballot you will not receive an email. Regimental flags of the British Army, historically described as ‘Colours', are consecrated and display insignia worn by the soldiers of respective units. The primary role of a Regiment's Colours was to provide a rallying point on the battlefield. This was vitally important because, without modern communications, it was all too easy for soldiers to become disoriented and separated from their unit during conflict. For soldiers to recognise their Regiment's Colours, it was necessary to display. This was done by young officers marching with the Colours held high between ranks formed up in lines. This is the origin of the word ‘trooping'. So, what today is a great ceremonial tradition began life as a vital parade designed to aid unit recognition before a battle commenced. The Foot Guards are amongst the oldest Regiments of the British Army and have served as the personal bodyguards of The Sovereign since the restoration in 1660 following the English Civil War. The ceremony of Trooping the Colour is believed to have been performed first during the reign of King Charles II (1660 – 1685). In 1748, it was determined that this parade should mark the official birthday of The Sovereign, becoming an annual event when George III ascended the throne in 1760. Although Her Majesty The Queen's actual birthday is the 21st April, the spectacular ceremony of Trooping the Colour remains the single national celebration of The Sovereign's official birthday. - Seated Stands H and J - via Downing Street and Treasury Passage (for Trooping the Colour reviewed by The Major General and Trooping the Colour reviewed by HRH The Duke of York only). On the day of Trooping the Colour reviewed by HM The Queen please use the same directions as given for stands K-N below. This is a formal State Ceremonial Parade in the presence of Her Majesty The Queen. Those attending are required to dress accordingly. Morning dress, lounge suit or jacket, tie and trousers, equivalent for ladies (no denim, shorts or sandals). NON-COMPLIANCE WITH THE DRESS CODE WILL RESULT IN REFUSAL OF ENTRY. Hats are optional but are recommended for paying the necessary compliments to Her Majesty and the Colours as they pass, as well as giving the necessary protection from the sun. Umbrellas/parasols are not permitted to avoid obstructing views.